If $18K and $20K are their true reservation prices, then no deal is possible, no matter how skilled or well-intentioned are these negotiators. 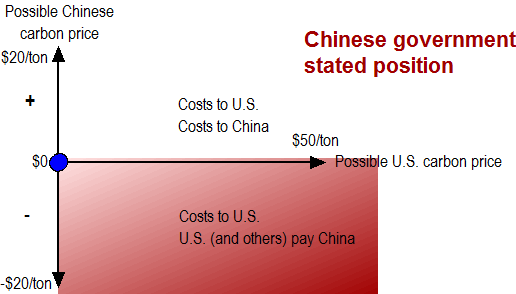 I think that on nationwide carbon pricing, there is no zone of possible agreement between the U.S. Senate and China. I don’t think a deal is possible, no matter what the President wants. And I think the President is not the principal U.S. party in this negotiation – he’s ultimately an agent. The disjointed U.S. Senate is the principal who must be sold on a global agreement. A positive carbon price reduces carbon emissions and imposes a cost on an economy. GDP is lower, incomes are lower. 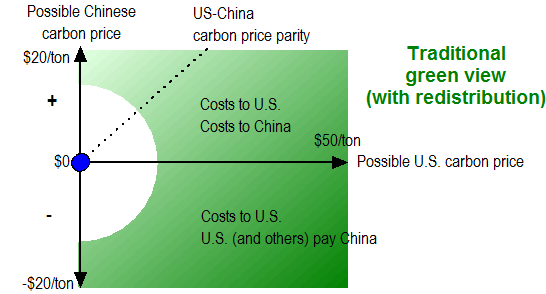 In addition, if the U.S. imposes a carbon price of $X and China imposes a price of zero, then the manufacture of carbon-intensive goods will naturally migrate from the U.S. to China. These economic costs are the primary reason why the cap-and-trade bill has been such a difficult debate in the U.S. Members of Congress have different views on how to measure and compare the economic costs and environmental benefits. The stated view of the Chinese and Indian governments is that the U.S. and Europe should set a positive carbon price, and China and India should set no carbon price. To go even further, it appears they believe that rich countries with historically high carbon emissions (like the U.S. and Western Europe) should also pay China and India to reduce their carbon emissions. I am going to use China in the following example. The same logic applies to all large developing nations, including Brazil, China, India, Indonesia, Korea, Mexico, Russia, and South Africa. These eight nations accounted for about 38% of global CO2 emissions in 2006. 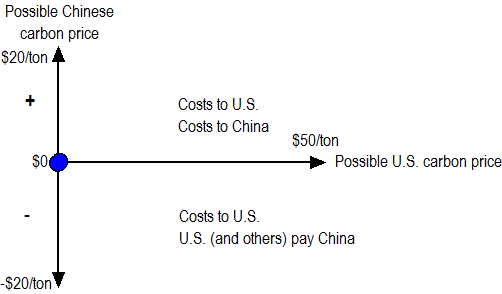 On the following graph the x-axis represents a possible U.S. nationwide carbon price, and the y-axis represents a possible Chinese nationwide carbon price. Whether they’re implemented through carbon taxes, nationwide caps, or a combination of sector-based policies is unimportant for this exercise. I will hand-wave past all that to simplify a national policy into a single number, the (probably implicit) price set per ton of carbon or CO2 emitted. 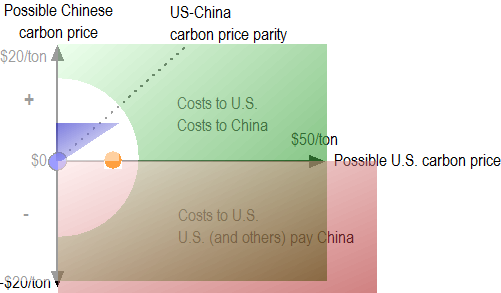 We are now at the blue dot: there is no nationwide carbon-price in either the U.S. or China. (I am ignoring lots of important sectoral policies like CAFE to oversimplify.) If the U.S. imposes a nationwide carbon price, as in the House-passed bill, then the blue dot moves right. There will be costs to the U.S. economy, and U.S. emissions growth will slow. The farther right we go, the more significant are both the economic costs to the U.S., and the reductions in U.S. (and therefore global) carbon emissions. The Chinese situation is a little more complex. The Chinese are signaling they will not accept a positive carbon price that would slow their economic growth. They are instead suggesting they should be subsidized to reduce their emissions – which you can think of as a negative carbon price (oversimplifying). The red shaded area represents what the Chinese government has said they would agree to, with darker red representing “better” from what I think is the Chinese government’s perspective. They would prefer to receive bigger subsidies and for the U.S. to pay a higher carbon price, so the red gets darker as you move down and right. The Greens (in the U.S. and around the world) want more global emissions reductions. The farther right you move, the more the U.S. reduces its emissions. The farther up or down you move, the more China reduces its emissions – a positive carbon price in China will force them to reduce their emissions, or bigger subsidy payments from the rest of the world can encourage them to do so. The farther you move from the graph’s origin, the more total emissions are reduced and the happier a Green will be. If you look closely you’ll see I have shaded the green so that it gets darker as you move down. In doing so I’m trying to show the alliance between climate change interests and more traditional Leftist agendas. A pure environmental policy position would value equally the top right and bottom right corners of the graph. But other left-leaning western political interests also believe that global income should be redistributed away from the U.S. and toward developing nations, including to large developing nations like China and India. The fiercest western Green advocates generally argue the U.S. should do a lot more (move right) and developing countries (including big ones like China and India) should not have to reduce their emissions, or even receive subsidies (move down). I can’t tell how much of this is a fellow-traveler policy view about the redistribution of income from rich nations to relatively poorer ones, and how much is a tactical decision by western Greens that the U.S. is more easily pressured than China. Here is my view on the marginal vote is in the U.S. Senate, shaded in blue below. it does not create too big of a competitive disadvantage for American firms relative to their Chinese and Indian counterparts. 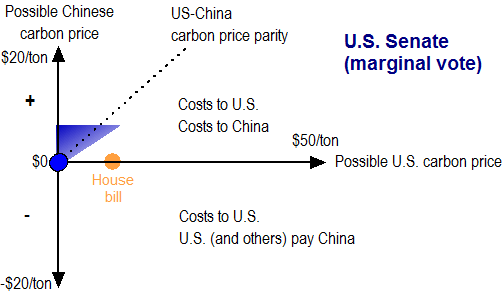 This second point is captured in the dotted line, which represents equal carbon prices in the U.S. and China. It’s easy to imagine a Member saying “I’ll vote for a reasonable (read: small) carbon price in the U.S., so long as it doesn’t disadvantage U.S. firms relative to Chinese and Indian competitors.” I’ve allowed a little room to the right of the dotted line to show that Congress might be willing to slightly “disadvantage U.S. firms, insisting on “parity” rather than “equality.” The orange dot represents the House-passed bill. It would set a positive carbon price for the U.S., but more than I think the marginal U.S. Senate vote is willing to support. OK, now put on your 3D glasses. Let’s overlay the Chinese government position (stated), the traditional Green view, and the marginal U.S. Senate vote. Is there any area where all three overlap, any Zone of Possible Agreement among all three parties? But those rapidly growing developing nations that will produce nearly all the growth in global carbon emissions in the decades ahead must do their part, as well. Some of these nations have already made great strides with the development and deployment of clean energy. Still, they need to commit to strong measures at home and agree to stand behind those commitments just as the developed nations must stand behind their own. We cannot meet this challenge unless all the largest emitters of greenhouse gas pollution act together. There’s no other way. A final warning: the above analysis cuts to the core issue of setting a national carbon price to illustrate the fundamental negotiating interests and tensions. Yes, there are areas for productive incremental cooperation. My favorite of these is the push for all nations to repeal tariff and non-tariff barriers to clean energy and carbon-reducing technologies, most effectively advocated by my former colleague Dan Price. Whatever incremental agreements are made, the above tension will remain, and it shows why I think a negotiated global carbon price is highly unlikely and the President is in a tough spot.